There are quite a lot of sliders out there these days, and many of them are excellent for timelapse, but quite a few of them have one big problem when it comes to video. That problem is noise, which can make it difficult to not only get a good sync track on the camera, but the slider can actually be picked up by dedicated microphones for external audio, too. We’d heard that the new Shark Slider Nano from iFootage, though, is whisper quiet. We wanted to hear this for ourselves, so we paid them a visit during NAB 2019 to find out more. If you want to take slider shots with your smartphone, there are a few DIY options you can make. But in this video, COOPH teaches you how to make an interesting automated DIY slider on a super-low budget. You’ll need a wooden toy car, a kitchen timer, a few household items and only a little bit of time. Of all the tools and devices on which we can place cameras, sliders have always been the one that intrigued me the most. I’ve used quite a few of them over the years and I still really enjoy using them whenever I shoot with one. Especially motorised ones. I’ve even spent some time over the last few months working on motorising one of my own sliders. For the last couple of weeks, though, I’ve been trying out the new Smartta SliderMini. It’s a mini motorised slider for video and timelapse with remote app control from your Android or iOS smartphone that just launched on Indiegogo. So far, I quite like it. I’ve been getting into 3D printing quite a bit this year. Mostly with regard to how it can help me with my own photography and video challenges. One of the first things I did was to motorise my camera slider. Now, my own efforts in this realm are still quite basic, but while researching how others have overcome certain issues in this area, I came across this tutorial recently posted to Instructables by jjRobots. It’s a tracking 2-axis motorised, mostly 3D printed camera slider. This means that it doesn’t just move the camera from one end of the slider to the other, but it also turns the camera. This way, your camera can move while remaining fixed on a specific target. And it’s all controlled from your smartphone – that app’s available for free, too. Syrp has just announced the new Magic Carpet Pro slider. Designed to handle some seriously heavy duty filmmaking the Magic Carpet Pro offers some very cool and interesting features. For a start, the flywheel is located in the carriage itself, removing the need for belts and pulleys for manual control. But this also allows for another perk. Combined with new “Track Joiners”, you are able to create a slider of just about any length you wish by simply adding more lengths of track. No longer do you need to worry about having belts of different sizes, regardless of how long you want to slide. Of course, you can also add motion control it if you wish by adding either the Genie or Genie II. Sliders are one of the best tools to come along for those who want to add some interest to their video and timelapse sequences. They come in all shapes and sizes, and many of us own one. I own three. What I don’t have, though, is a good small motorised slider. That’s where Rhino Camera Gear’s new ROV slider hopes to fit in. Rhino are no newcomers to sliders or timelapse gear, yet the new product is being launched through Kickstarter. And it sees some pretty good early bird deals, too, with backers able to acquire their own ROV slider for as low as $229. It looks like a neat piece of kit. Definitely handy for throwing in your backpack for those impromptu timelapses while out with your phone. We all remember The Matrix and Neo dodging bullets. It inspired many enthusiasts to create the bullet time effect on the budget, and there have been some pretty creative solutions. Photographer and filmmaker Daniel DeArco has made the world’s fastest camera slider, which alone is pretty impressive. But he also paired it with slow-motion shooting, in order to get the effect similar to the bullet time. The result is awesome, and he shares some sample shots and the BTS video. If you’re in search for a camera slider, Austrian startup Waterbird Systems will make you say “Shut up and take my money.” They have developed Multi Slider, a bendable slider which enables linear and curve camera tracks in the same product. You can change it from a linear to a curve slider at any demanded radius in only a few seconds. Also, you can control it either manually or via mobile app. Whether you’re a cinematographer or a timelapse photographer, I’m sure you’ll find this product useful. When we were kids, most of us played with Legos. Now, as grown-ups, we play with cameras. 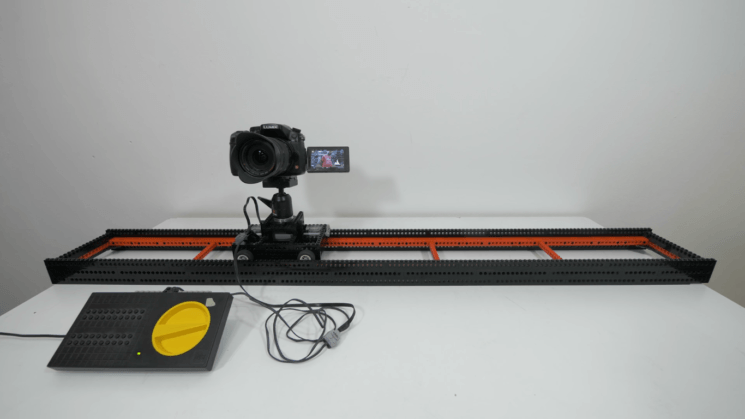 Dutch filmmaker Victor Bart brought the toys of his childhood and adulthood together: he created an impressive camera slider almost entirely out of Lego parts. The only things not made out of famous plastic bricks are the ball head and of course, the camera. The dolly, the slider tracks, and even the controller – they were all made using Legos. At some point or another, most of us that shoot video have to create a clip sliding past, or moving around some kind of static object. Perhaps something small, like a pair of rings for wedding shooters, or it could be something as large as a car. In this video from DSLR Video Shooter, Caleb Pike walks us through the process with techniques and tips to get a smoother final video using some slow motion tricks.